I have this model with bone what are already weighted. 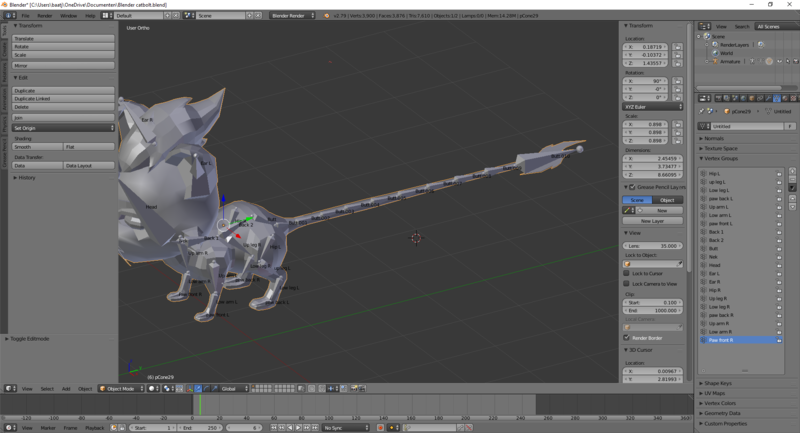 but now I need to add the tail model so I went to edit mode and extruded more from the but bone to the end of the tail. for some reason the bones do not appear in the vertex groups… I'm sure i'm doing something wrong but I don't know what.... is it possible to add these bone without ruining my model? For the bones to deform an object, correspondingly named vertex groups must exist on the mesh. However, not all bones have to deform the mesh. There are often more bones which are just for the mechanics of the rig. But that's no problem, you can just add another vertex group with the + symbol. You have to name it exactly like the bone. If the mesh and the armature are connected via an armature modifier, renaming the bone will rename the vertex group from now on. Another option is to simply select the mesh and go into edit mode, with the armature in pose mode. Clicking on a bone, which doesn't have a corresponding vertex group yet, will color the mesh in purple. When starting to weight paint on the mesh, a vertex group for the bone will be created automatically. Add weight to all vertex groups on an object? How to batch rename bones and their corresponding vertex groups?